Es dürfte davon zwei Stück geben, die schon Ende Oktober 2015 ausgeschrieben worden. Minderausgaben bei der Erstellung von Grundstückseinrichtungen (4,7 Mill. EUR) wegen Verrechnung auf dem VA-Ansatz 1/40138, bei Pioniergerät (4,5 Mill. EUR) aufgrund Verzögerungen bei der Ausstattung der Baupionierkompanie sowie der Neuausschreibung für die Grundüberholung des Pionierpanzers. Weiß jemand etwas darüber? Ich glaube nicht, dass diese Grundüberholung jemals umgesetzt worden ist. Das ÖBH verfügt mit der Pionierbrücke 2000 über ein einziges schnell verlegefähiges Brückengerät. Die sechs vorhandenen Fahrzeuge sollen in den kommenden Jahren durch ein leistungsfähigeres System mit einer höheren Tragfähigkeit (MLC120) abgelöst werden. Hat diesbzgl. jemand schon etwas gehört? Ich höre das zum ersten Mal. Die Pionierbrücke 2000 wird übrigens seit Jahren nicht mehr gebaut, weil die Eurobridge GmbH, die ein Teil von EADS war, im Jahr 2007 aufgelöst wurde (Ab dem Geschäftsbericht 2007 scheint diese Firma nicht mehr als Tochterunternehmen auf.). FRIEDRICHSHAFEN/VIENNA --- Eurobridge Mobile Brücken GmbH, a subsidiary of Dornier GmbH, a member of DaimlerChrysler Aerospace AG (Dasa/Munich), has signed a contract with the Austrian Ministry of Defense (BMLV) concerning the production and delivery of the military bridge 2000. This was reported by Dornier GmbH on Tuesday in Friedrichshafen. The contract comprises six bridge units with a total length of 240 meters, 24 transport vehicles and six launching vehicles, the core of the bridge system. Delivery of the first system is scheduled for the beginning of 2001. Peter Ibbeken (head of the Dasa Ground and Naval Systems Business Unit and president of Eurobridge Mobile Brücken GmbH) said : " This contract amounting to more than 30 million euros was another success in the marketing of our product Foldable Bridge DoFB in the international competition. After Germany, Spain and Singapore, Austria is the fourth nation which will use the Eurobridge product. 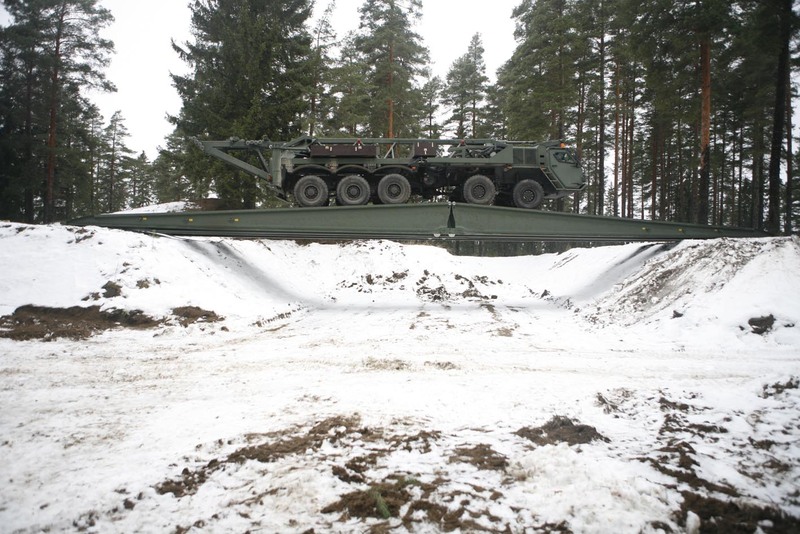 We have thus impressively demonstrated our role as a leading manufacturer of the new generation of tactical support bridges." The modular design of the foldable bridge FFB allows flexible lengths between 14 and 40 meters (export variant DoFB available for up to 46 meters). A crew of six people can deploy the bridge in approximately one hour. The 4.4-meter wide bridge features a closed deck. It has a load-carrying capacity of up to 110 tons. The bridge bays are folded to a width of 2.75 meters during transport. Both the folding and unfolding of these bays is carried out exclusively by gravity, i.e. without an additional power source. The principal component is the launching vehicle equipped with a fulcrum system, a launching beam and a crane. The vehicle approaches the gap backwards. The hydraulic fulcrum system positions the vehicle onto the river bank. With the help of the crane and a carriage-like launching beam, the individual bridge components are coupled to span the gap in cantilevered launching. Subsequently, the crane lifts the individual bridge ramp and inner sections from the transport trucks. The segments are automatically unfolded and locked as they are lifted, placed on the traversing beam one after another, coupled and then hydraulically moved to the opposite bank. 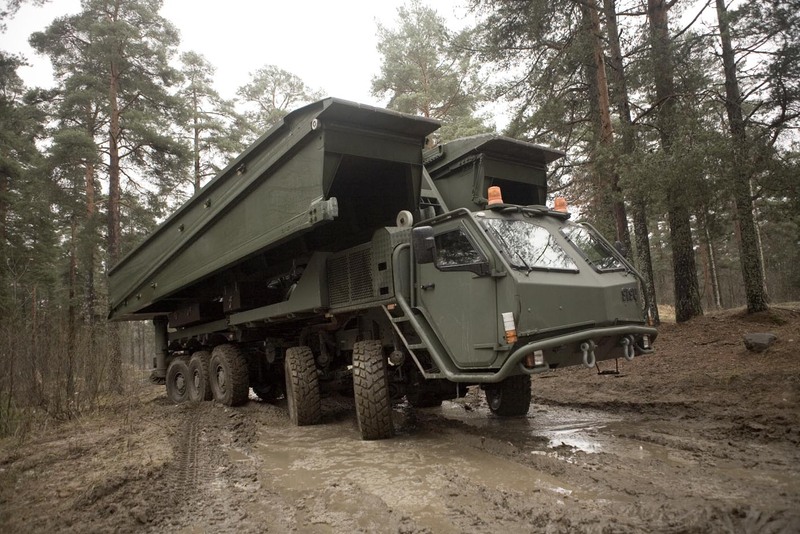 Due to the broad and closed trackway, the FFB is suitable for all types of vehicles and is thus particularly appropriate for disaster relief missions. In addition to the production standard, these characteristics were of particular importance to the Austrian Armed Forces. Dornier GmbH is a member of DaimlerChrysler Aerospace AG. Dasa, the French Aerospatiale Matra and the Spanish Construcciones Aeronauticas (CASA), who have been partners for many years, are merging to the European Aeronautic Defence and Space Company (EADS), one of the three leading aerospace companies in the world. Zuletzt geändert von theoderich am Sa 27. Okt 2018, 06:16, insgesamt 6-mal geändert. wäre gut wenn weitere Pionierbrücken angeschafft werden. Da das ÖBH sowieso nicht mit modernen Brückenanlagen überhäuft ist, sollten die angeblich anzuschaffenden neuen PiBrücken die vorhandenen PiBrücken 2000 ergänzen und nicht ablösen.